The rest of my time at Sturgis was pretty low key. 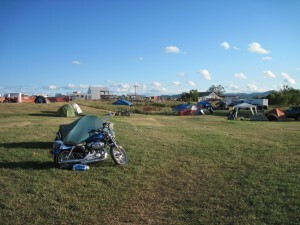 Spent some time in Sturgis just looking around, but also spent much of the time right at the campground. Hung out a Bikini Beach and made some friends at Senor Wiener’s. Watched PeeWee Herman shoot some scenes. I didn’t do much riding this year, partly because it was so painful just getting through town, partly because I didn’t want to spend the money, and partly because I didn’t want to risk it. Funny how economics and lack of insurance can spoil a party. 🙁 But I still had a really great time and pretty much did what I wanted to do, which was get out of town and relax a bit. Sunday came and it was finally time to leave. It was almost shocking to look around and where a day ago you couldn’t find a piece of ground was now a wide open view. Folks really started clearing out by Saturday and by Sunday it was just the stragglers. Except the RVs. Still a lot of RVs around on Sunday. I guess if you’re that wealthy, you’re not in any hurry to get back to work. I hit the road at a reasonable hour. Didn’t need to leave before dawn as I only had a couple hundred miles to go. Made a reservation at a lovely hotel in Lemmon, SD for the evening and was really looking forward to a hot tub, hot shower, and soft bed. It’s always bittersweet leaving, but the party was definitely over and it was time to head home. 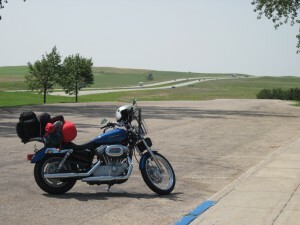 Of course all the other traffic on the road was also heading away from Sturgis, so it wasn’t the usual lonely roads. And of course, once again, everyone is passing me by. Still fun to wave. Pretty easy ride until I had to turn north. A crosswind made it a little more strenuous and I was looking forward to my gas stop. As usual during bike week, the gas stop was nothing but bikes lined up. This is that same gas station that you have to go inside to pay. Had an almost-incident there. No gas spill this time. But I left my bike at the pump while I paid (no one behind me at the time), but when I got back out there was an RV waiting to fill. Thought I’d just put the bike in neutral and push it out of the way. I must have been more tired than I thought, but somehow the bike got off balance and started leaning to the right. Dammit I was going to drop the friggin’ loaded bike right at the gas pump! Well with everything I had I was holding that bike up and yelled “Help!” Well, that got a look, but nothing else. Reached deep down again and yelled a bit louder “Can I get a little help? !” Well that got a couple of guys over to get the bike set straight again. THANK YOU whoever you were. If I was tired before that, my arms were now an inch longer and complete jello. After a few minutes rest, I decided to get back on the road. I was determined to make my favorite cafe in Lemmon for lunch and I knew they closed at 2 p.m. If I got to it I’d make it in time, but I didn’t have time to waste. Another northbound leg of the trip meant more crosswind, so I got to wave at all the folks that were standing around at the gas station as they passed me. I hope the guys that helped me out were among them. Made it to the cafe at something like 1:50 p.m. Slopped into a booth and ordered my Alaska Burger and realized that everyone in the place was heading home from Sturgis, most of which were the folks that had passed me on the road. I enjoyed my burger immensely and chatted with the staff a bit. I really do love that place. Wish it was a bit closer to home. It took me a long time to eat that meal and I kept expecting to be shooed out of the place. But the staff was smart and knew an opportunity when they saw one. They were staying open late to accommodate the biker crowd. Only happens once a year, you know. I told you the entire state of South Dakota gets involved in Rally week. They were open until at least 4 p.m., perhaps much later. The good news is that the hotel is just across the street from the cafe and I checked in in the middle of the afternoon. Hauled my gear into the room and immediately found my suit and headed for the hot tub. I sat in there for 3 hours. I knew I wasn’t going to be hungry after the big burger, so I really had no place to go and nothing to do. Hot tub was an awesome way to finish up the trip. Worth every dime of the hotel fee. And then there was the bed. And the TV. And the shower. Civilization can be good. Some folks might be disappointed by a week at Rally with only a few trips into town and no real riding in the Black Hills. For me, this year, it was exactly what I needed. But I can’t wait to go back and take in a few of the activities I didn’t make this year. You could probably go for 10 years in a row and not do the same thing twice. All in good time. Because it is a good time. Great to see you blogging! Thanks for sharing your trip to Sturgis! Julie, I just read on Twitter you had a blog! I’m glad you wrote about it there or I’d have missed this great story! I’m gonna link you on my page! Enjoyed the story…better because you’re a near local writing about how you see the place before and after the influx…thanks for the heads up on this terrific blog! 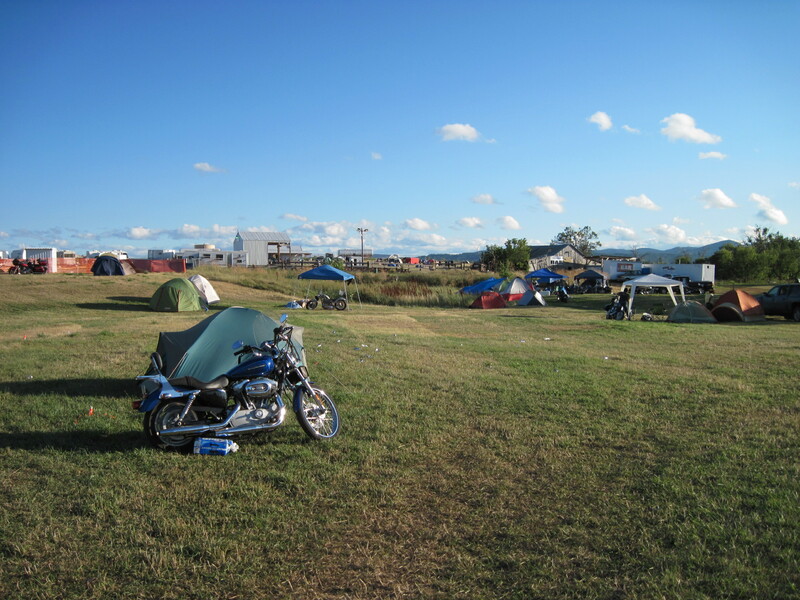 Hopefully, someday…we will get the chance to meet up in Sturgis!